Dr. Sudarshan Kapoor constructs peace every day. He creates organizations, partnerships, and coalitions dedicated to peace with justice. 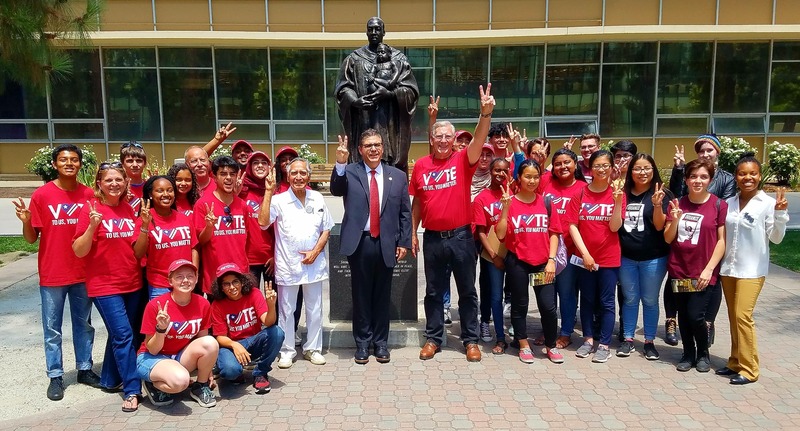 Dr. Kapoor is the former founding director of the Peace and Conflict Studies program and is the creator of the Peace Garden located on the Campus on Fresno State. The Peace Garden provides a deeply moving experience, it consists of life size sculptures featuring nonviolence leaders who have transformed themselves and helped humanity move towards sisterhood and brotherhood. The statues feature Mahatma Gandhi, the Rev. Martin Luther King Jr., Jane Addams and César Chávez. Dr. Kapoor came from India and has taught for 50 years at Fresno state. He carries with him the compassion of a kind heart and the firmness of a dedicated mind. He embodies the principle, that the goodness of the heart requires a focused and open mind to serve others we must not only feel affection and solidarity. We must also develop the intelligence and wisdom necessary to put our feelings into action.